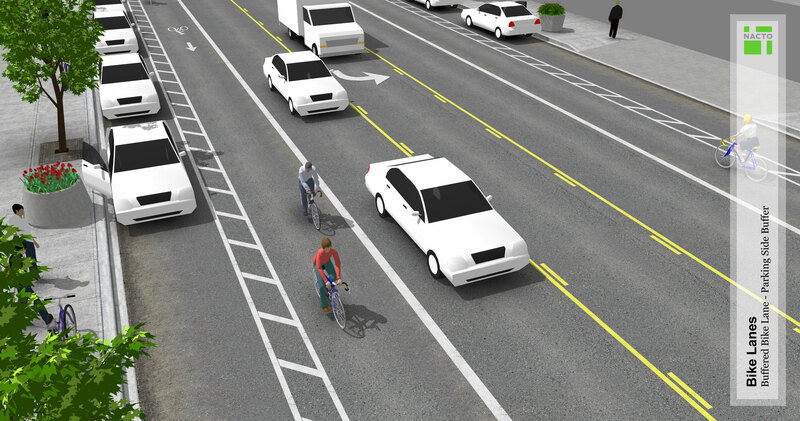 Buffered bike lanes are conventional bicycle lanes paired with a designated buffer space separating the bicycle lane from the adjacent motor vehicle travel lane and/or parking lane. 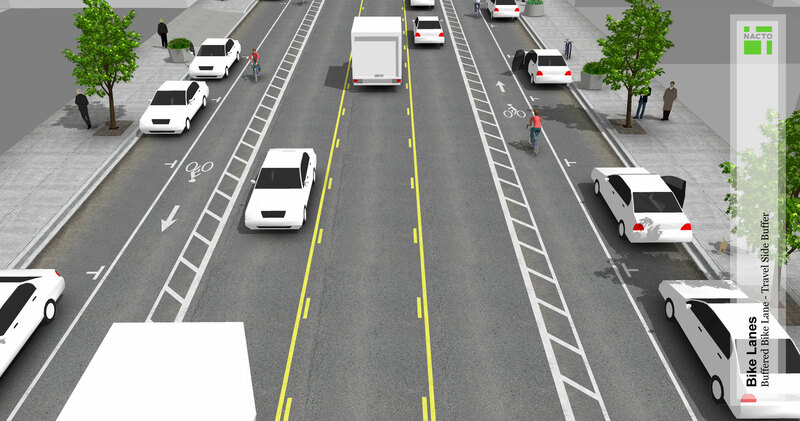 A buffered bike lane is allowed as per MUTCD guidelines for buffered preferential lanes (section 3D-01). 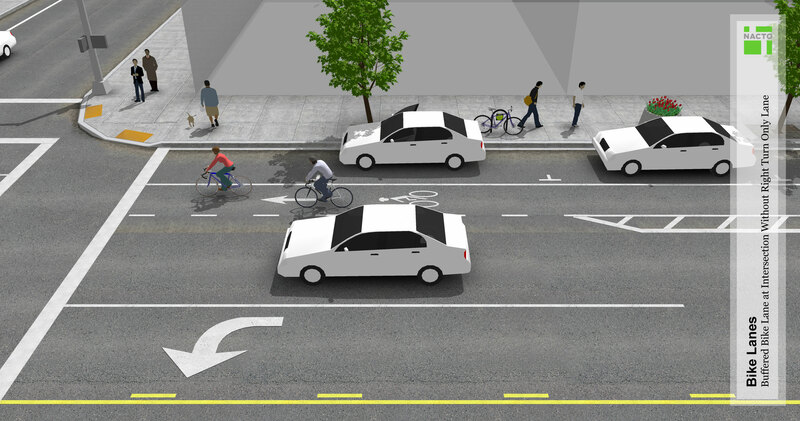 Click on the images below to view 3D concepts of conventional bike lanes. The configuration shown is based on New York City, NY, and Portland, OR, examples. Portland State University, Center for Transportation Studies. (2011). 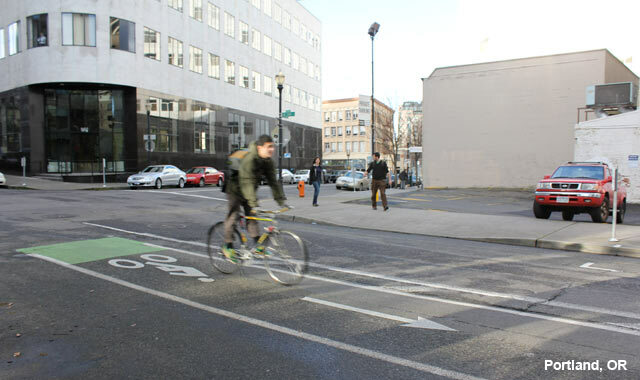 Evaluation of Innovative Bicycle Facilities: SW Broadway Cycle Track & SW Stark/Oak Street Buffered Bike Lanes FINAL REPORT. Portland Bureau of Transportation, Portland, OR. 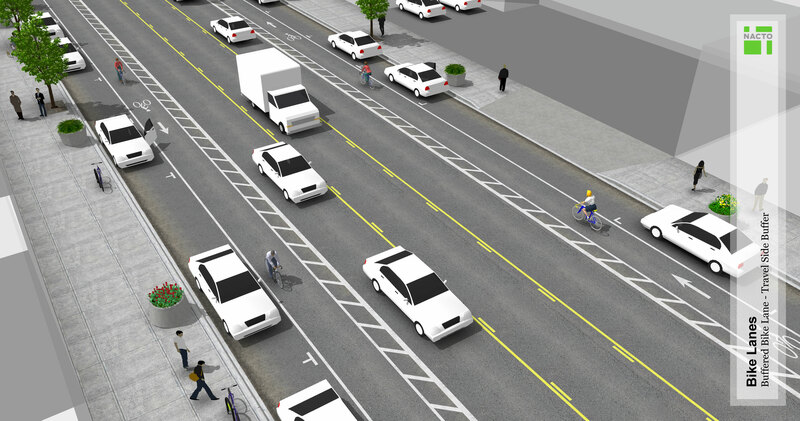 Anywhere a standard bike lane is being considered. On streets with high travel speeds, high travel volumes, and/or high amounts of truck traffic. On streets with extra lanes or extra lane width. Special consideration should be given at transit stops to manage bicycle & pedestrian interactions. 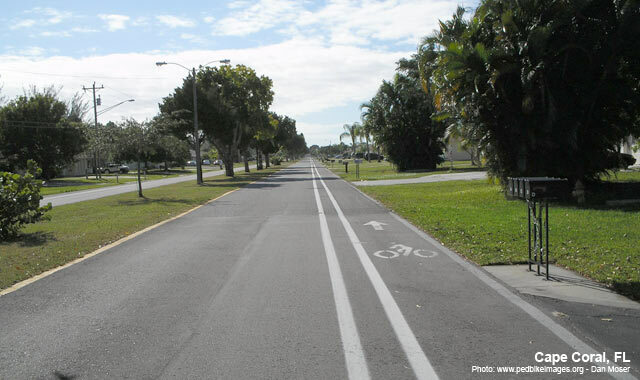 Guidance for conventional bicycle lanes will also apply. Federal Highway Administration. (2009). Manual on Uniform Traffic Control Devices. Section 3D.01. Federal Highway Administration. (2009). Manual on Uniform Traffic Control Devices. Section 3D.02. Federal Highway Administration. (2009). Manual on Uniform Traffic Control Devices. Section 3B.24. 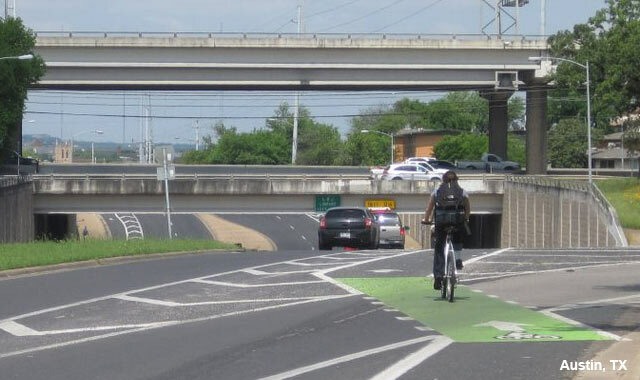 The combined width of the buffer(s) and bike lane should be considered “bike lane width” with respect to guidance given in other documents that don’t recognize the existence of buffers. 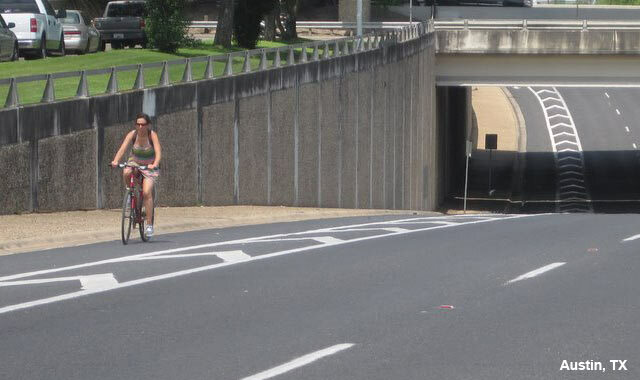 Where buffers are used, bike lanes can be narrower because the shy distance function is assumed by the buffer. 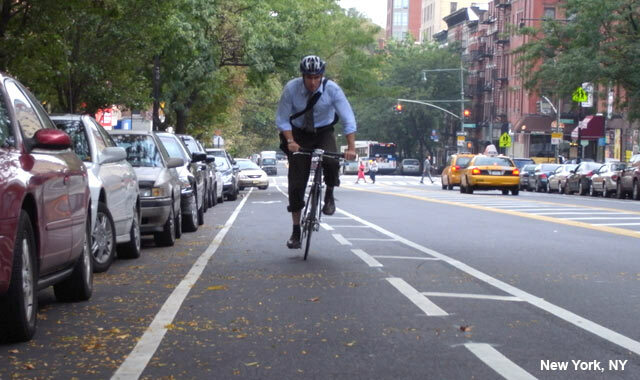 For example, a 3 foot buffer and 4 foot bike lane next to a curb can be considered a 7 foot bike lane. 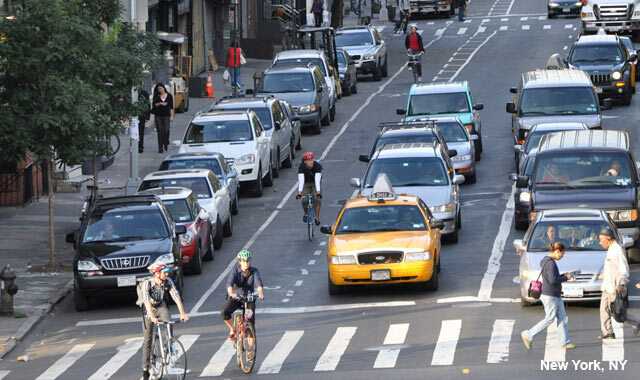 For travel side buffered lanes next to on street parking, a 5 foot minimum width is recommended to encourage bicyclists to ride outside of the door zone. 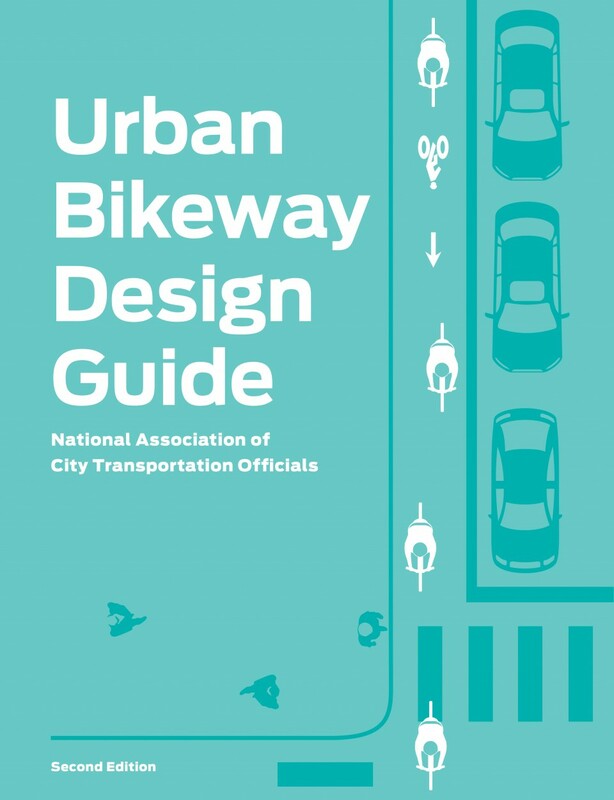 Where bicyclist volumes are high, bicyclist speed differentials are significant, or where side-by-side riding is desired, the desired bicycle travel area width is 7 feet. 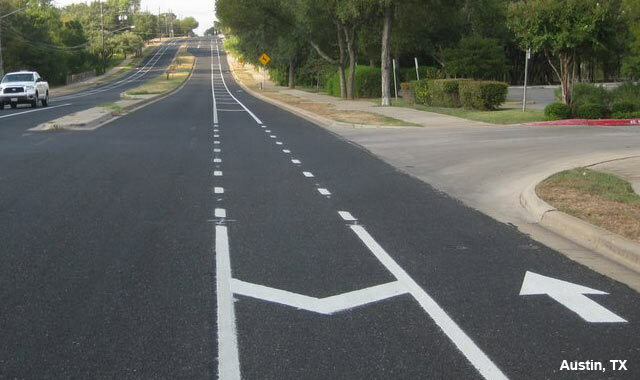 Buffers should be at least 18 inches wide because it is impractical to mark a zone narrower than that. 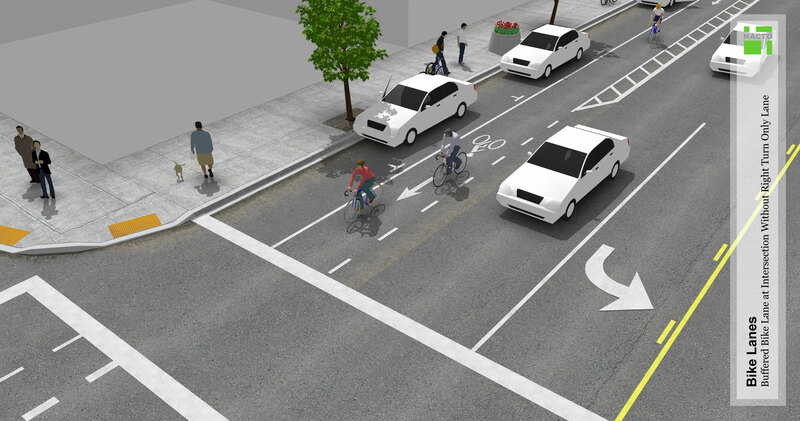 On intersection approaches with right turn only lanes, the bike lane should be transitioned to a through bike lane to the left of the right turn only lane, or a combined bike lane/turn lane should be used if available road space does not permit a dedicated bike lane. On intersection approaches with no dedicated right turn only lane the buffer markings should transition to a conventional dashed line. Consider the use of a bike box at these locations. 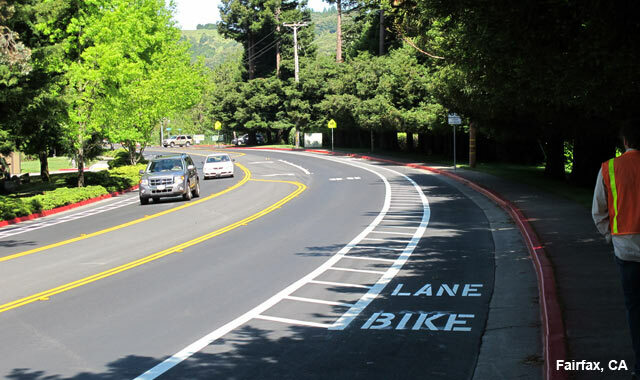 Like a conventional bike lane, a wide (6-8 inch) solid white line may be used to mark the edge adjacent to a motor vehicle travel lane. For a parking side buffer, parking T’s or a solid line are acceptable to mark between a parking lane and the buffer. 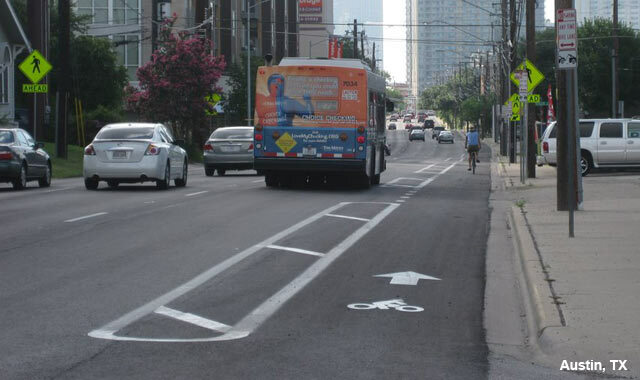 For travel lane buffer configurations, separation may also be provided between bike lane striping and the parking boundary to reduce door zone conflicts. This creates a type of parking-side buffer. 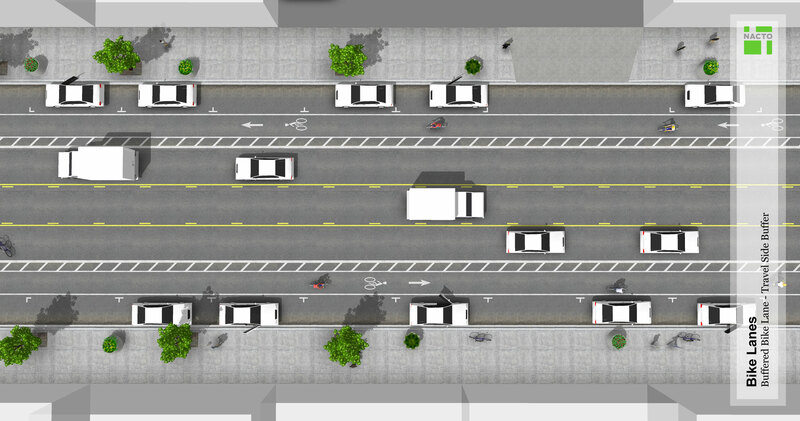 On wide one-way streets with buffered bike lanes, consider adding a buffer to the opposite side parking lane if the roadway appears too wide. This will further narrow the motor vehicle lanes and encourage drivers to maintain lower speeds. 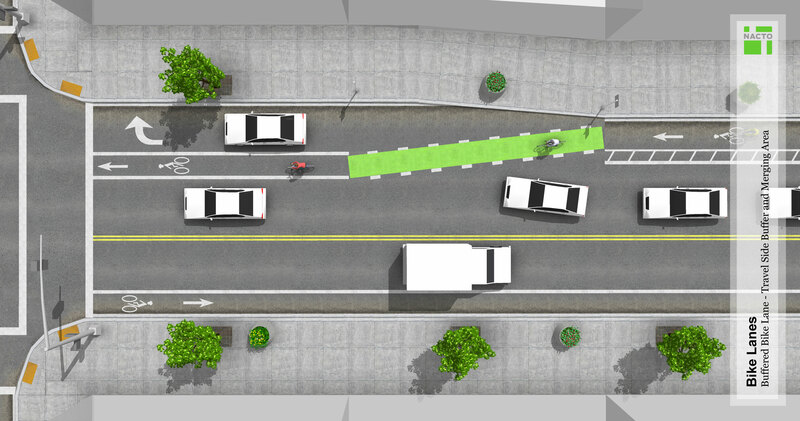 The interior of the buffer area may use different paving materials to separate it from the bike lane. 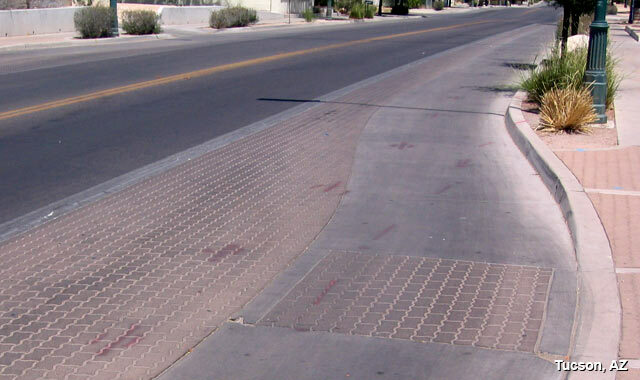 Textured surface materials may cause difficulties for bicyclists as surfaces may be rough. Increased maintenance requirements are likely. 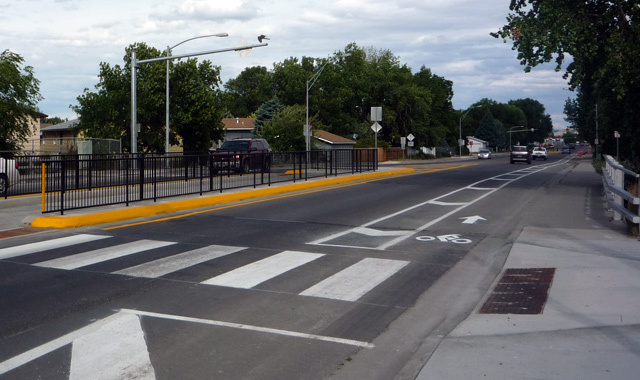 Color may be used at the beginning of each block to discourage motorists from entering the buffered lane. 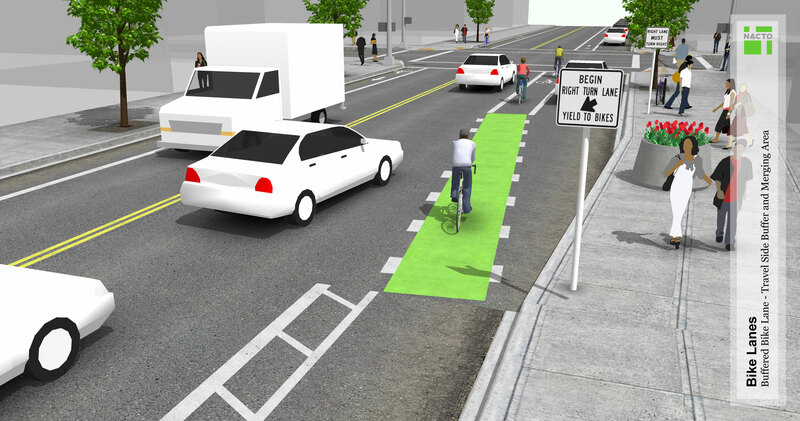 For other uses of color in buffered bike lanes see colored bike facilities. 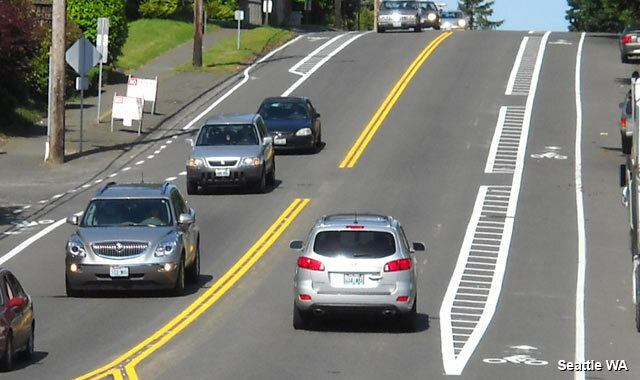 Buffer striping may require additional maintenance when compared to a conventional bicycle lane. 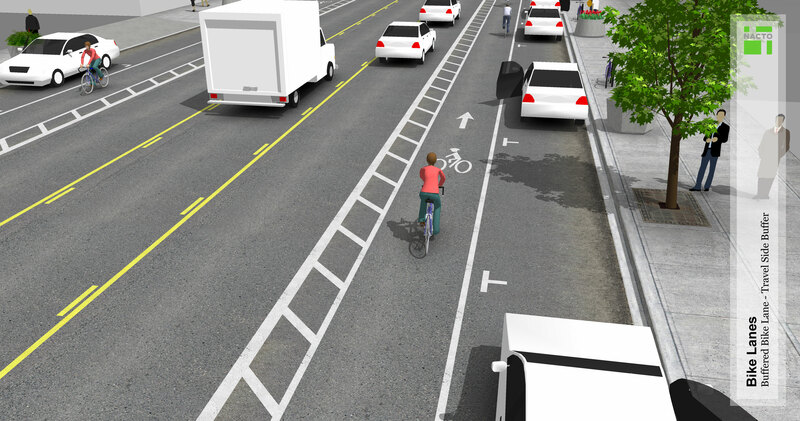 If trenching is to be done in the bicycle lane, the entire bicycle lane should be trenched so that there is not an uneven surface or longitudinal joints. 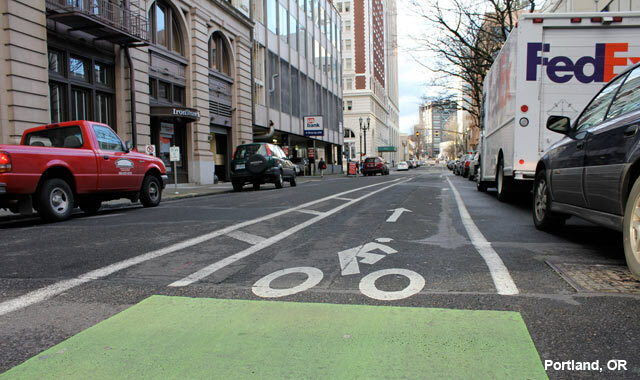 See conventional bicycle lanes for additional maintenance issues that may apply. Click to see the complete reference material for this treatment. 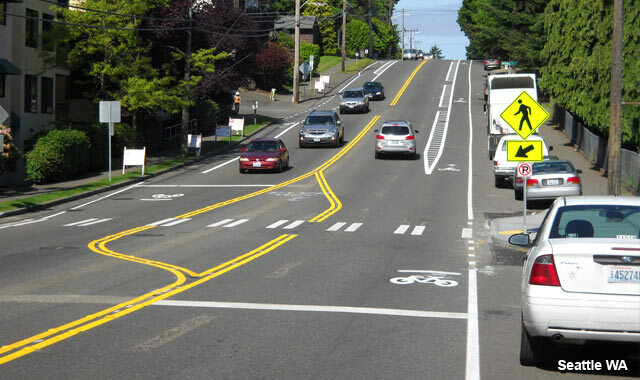 References for Buffered Bike Lanes: 8 found.